Did you say 'recession'? Heir Island Sailing School is reporting a 'boom', according to its latest press release. Between 2009 and 2010 the sail training activity and generated income of this Sailing School situated at Heir (Hare) Island, West Cork, has largely increased in this extremely difficult year for sports and tourism industry. The Principal John Moore has discounted all prices by 20 to 30%. All 2009 sailors returned in 2010 and brought friends with them. The French network of the newly appointed Director of Sailing Hugues Traonmilin has brought French families to the island and the French sailors were mixed with the Irish and British children and adults with great success. In addition to a busy summer season, 60 students of a South East College came for the very first time to the Sailing School in March 2010 as part of the Transition Year programme. They were hosted with full board accommodation at the Sailing School Guest house. Definitely the location of the Sailing School plays a big part in this success story. Heir Island is located in the middle of Roaring Water Bay half way between Schull and Baltimore. Whatever direction you sail from the Sailing School beach, you'll encounter wonderful maritime landscapes and crystal clear waters. The Topaz dinghy fleet may sail to 3 or 4 different sandy beaches on one sailing day. 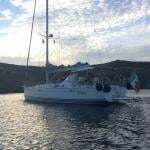 The 3 Dublin Bay Mermaids sailing in flotilla explore the surrounding islands of Castle Island, Sherkin Island, the 3 Calves Islands and of course the Carthy's Islands to visit the seals colony. Such a fantastic location has orientated the programme of this Sailing School towards the "Adventure" courses of the Irish Sailing Association. The school offers Adventure 1 & 2 courses as their "speciality" course. 2011 perspectives are already very encouraging with a second college to be hosted in Spring for a 10 day transition programme meanwhile the first one is returning after excellent feedback of the 2010 students and teachers. 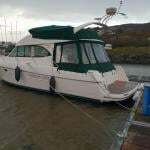 Being a family run business makes this small company very flexible and the range of their activities covers young sailors from 8 years old to adults, groups and families, on dinghies or on a traditional Heir Island Lobster Boat, and on kayaks if you don't want to sail. Also as a qualified Yachtmaster Instructor, the director of sailing has facilitated individually tailored sail training for yacht owners aboard their own yacht, an option that has proven both practical and successful.